Newly qualified nurses starting their career in London can look forward to good quality preceptorship thanks to the development of a framework by the Capital Nurse programme that standardises the support offered by employers’ schemes. Newly qualified nurses starting their career in London can look forward to good quality preceptorship thanks to the development of a framework by the Capital Nurse programme that standardises the support offered by employers. Many nurses will remember fondly their early days of practice. Friendships that last for life, the first night shift and the fun of being part of a team – both in and out of hospital – can make the first months of nursing memorable. However, many nurses would confess to also feeling a little anxious at times, not quite knowing what they were doing and the occasional crisis of confidence. For some nurses those feelings can persist and may even lead to them leaving the profession. 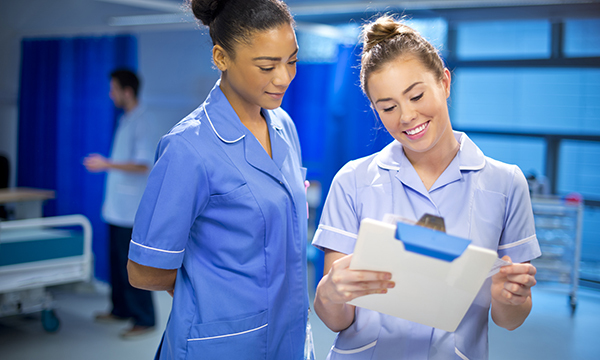 It’s well recognised that providing support and additional development to newly qualified nurses (NQNs) in the early months in their first job can help them grow in confidence and skills – and may have a positive effect on their whole career. Many trusts have developed preceptorship programmes to meet this need, but these can vary in length and the level of input a nurse receives. Now nurses in London will be able to access a scheme that offers a standard framework for preceptorship. It has been developed by Capital Nurse, a Health Education England sponsored programme that aims to improve retention in London. Trusts, nurses and other stakeholders have contributed to the development of the framework, which is intended to offer guidance on preceptorship for all organisations, regardless of whether they are big teaching trusts or small primary care settings. Health Education England dean of healthcare education Louise Morton says the guidance is intended to be flexible. But while the details of what is offered may differ from place to place, the standard should be constant, giving both the nurse and potential employers confidence about what they can do. The framework is intended to be a work in progress, allowing it to evolve. Trusts can – and do – deliver it differently. But is it a sign that some trusts’ schemes were not up to scratch? Ms Morton acknowledges there was ‘variability’ on what was on offer, but says this was sometimes justified by the local situation. Students often look for a good preceptorship programme when deciding where to take up their first job, she adds. Many trusts in London already had a well-developed preceptorship system but are still enthusiastic about the new programme. Ruth Sivanesan, placement development facilitator at Guy’s and St Thomas’ NHS Foundation Trust, says being involved in the work for Capital Nurse – and meeting nurses involved in preceptorship at other trusts through it – has led to some changes in their own offering. ‘It has helped us look at what we are doing and be a bit more critical. The framework has given us the weight to ask for the things we think we need and the things that newly qualified nurses feel they need in that first year,’ she says. For example, NQNs can also access career coaching, and the trust is developing a celebratory event to mark the end of the preceptorship year for nurses. At Great Ormond Street Hospital nurses have a 12-month preceptorship programme with designated development days. It has been in place for some time and will adopt some – but not all – of the Capital Nurse framework. This extends to preceptors as well as preceptees – they need support as well to do their job. Ms Keane says they are often a ‘second line’, someone the NQN can go to who is not so immediately involved in their work. She identifies confidence as a key issue for newly qualified nurses. The trust measures this during the period of preceptorship and sees it improve dramatically. Preceptorship can also help nurses feel less isolated and realise that their problems and concerns are shared by their peers. The preceptorship framework is just the first step for London nurses. The Capital Nurse programme is looking at their entire path through the NHS – from deciding to study in London through to having an established career. A good experience in their first year can get newly qualified nurses off to a flying start. Gemma Harman worked as a carer for dementia patients before training as a nurse in her 30s. But just over two years after qualifying she is already a band 6 junior sister, has been encouraged to look at band 7 jobs and is doing a master’s degree. She believes the 18-month preceptorship programme at Barts Health NHS Trust helped her to become more confident in her role and then to develop additional leadership skills. She feels that having a preceptor who is not part of the immediate ward team is helpful. Like many new nurses, she says her first days in the job were nerve-wracking, especially as she worked in an area with acutely unwell patients who needed breathing support in an acute assessment unit. But as well as the more obvious clinical areas, she says she appreciated the holistic approach of the programme, with sessions on mindfulness and well-being. She is now a preceptor herself, and says she understands how NQNs feel: ‘There is no stupid question.’ She can see a clear link to recruitment and retention from having a good preceptorship scheme, and although she trained before the Capital Nurse framework was launched she has helped provide feedback on it. Her experience is echoed by Modesta Kamwenje, a practice development nurse in older people’s and stroke services at Barts. She too has become a preceptor after having a good experience as a preceptee. ‘I had a very good preceptor who helped me through the transformation from student to nurse, and this support made me feel more confident,’ she says. A preceptorship period of at least six months, with a recommended length of 12 months. A minimum two weeks of supernumerary experience, including induction. Protected time for both preceptee and preceptor. A series of meetings between the two throughout the preceptorship period – they should also work together for at least four days in the first month.